Killing Eve Renewed for Season 3 - What's the Catch? AMC has confirmed when two fan-favorite dramas will return to the air, and the wait is not too long. Get all the details, The Terror and Lodge 49 Fanatics! The Walking Dead is getting another spinoff at AMC. The cabler has given a 10-episode order to a third series set in the franchise. Get all the details. Is Negan about to be redeemed after his heroic act on The Walking Dead Season 9 Episode 16? Get all the latest details right here via TV Fanatic. Fear the Walking Dead Season 5 Trailer: Hello, Dwight! Fear the Walking Dead Season 5 has a premiere date, and a deadly new trailer that brings two characters from The Walking Dead-verse back into the fold. 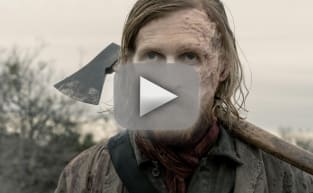 The Walking Dead Promo: The Whisperers Make Their Move! On The Walking Dead Season 9 Episode 15, the Whisperers will make another play for power, and it looks like we could be losing some key players. Watch the promo. Orphan Black could be staging a comeback with a brand new series, and we have all the details you need, TV Fanatic. Read on for all the deets. The Walking Dead Sneak Peek: Does Lydia Trust Alpha? On The Walking Dead Season 9 Episode 12, Lydia finds herself weighing up her options as her mother continues to act crazily. Watch the full clip. The Breaking Bad movie will star Aaron Paul and will debut on Netflix before heading to AMC. Get all the latest details right here via TV Fanatic. The Walking Dead Renewed for Season 10! The Walking Dead has been renewed for Season 10 at AMC, and the network has already announced when fans can expect the season to get underway. The Walking Dead and Fear The Walking Dead: Second Crossover Confirmed! Fear the Walking Dead is giving another The Walking Dead character a second shot at life, and we have all the details you need about this exciting news. Chandler Riggs has opened up about what it felt like being written out of The Walking Dead after eight seasons, and we have all the details.